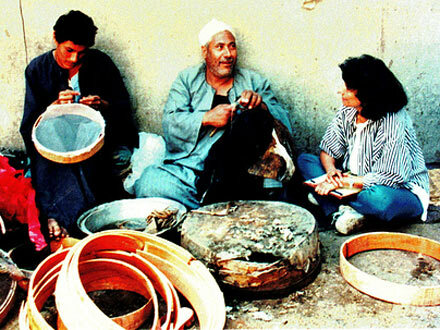 This film examines the Egyptian rural craft of making a sieve called ghurbal (from the Arabic ghurbal meaning “to winnow” which is used to both “winnow” babies on their seventh day of life and to winnow grains for making ceremonial dishes, particularly kouskousi. Embedded in this material culture artifact are layered meanings of creative regeneration of the cosmic and human worlds. We visually follow the material process from tree log cutting to making the tara (ghurbal frame), to ghurbal crafting, through the voice and image of two key persons: Na’ima, the craftswoman and owner of the frame shop, and Hoksha, the rural ghurbal craftsman. The ethnographer/filmmaker engages them to speak and we are drawn into their lives by their stories as we view self-confident mastery of their craft. While Hoksha relates how he has kept this child from his father, we see his son next to him making a modern flour sieve, having never learned the family tradition. Hoksha sits in the courtyard of his village home skillfully weaving animal skins to create a ghurbal that celebrates a new life in sebou’ ceremonies, as his own identity intertwines with the sacred and earthy rhythms of daily Egyptian rural life. This is woven by the anthropologist into a visual ethnography of the sociology, technology, economy, politics and religion of a traditional Egyptian sieve.